Law enforcement officers are unique in that they have the power to issue lawful orders to the population at large. These orders may be necessary to preserve public safety or maintain order during an emergency situation. If the public was allowed to freely ignore lawful orders, these law enforcement agencies would have no meaningful way to carry out their responsibilities. As a result, disobeying a peace officer is a criminal offense under California Vehicle Code Section 2800 VC, and a conviction under this statute can carry serious consequences. The defendant willfully refused or failed to comply with a lawful order, signal or direction of any peace officer. AND the peace officer was in uniform and was performing his duties. Under California Vehicle Code Section 2800 VC, it also illegal to ignore a lawfully issued “out-of-service” order. An out-of-service order is issued to vehicles that are deemed unsafe to operate or are not properly equipped. The out of service order may be issued by the California Highway Patrol or any uniformed peace officer, the United States Department of Transportation, or a peace officer or commercial vehicle inspector from any state, any Province of Canada, or the Federal Government of the United States, Canada or Mexico. A man is driving home when he encounters a massive traffic jam. Apparently, a multi-car collision has occurred on the road ahead of him and all lanes of traffic have been closed while emergency services are rendered. The man is impatient and wants to go home so he ignores the California Highway Patrol officers on the scene and drives through the cordoned off accident scene. This man could be prosecuted for disobeying a peace officer in violation of California Vehicle Code Section 2800 VC. In another example, an operator of a semi-truck is cited for numerous violations on his big rig and is issued a lawful “out-of-service” order by officer. The next day, the officer observes the man driving the same big rig. The officer stops the man and confirms that he did not fix any of the violations. This man could be charged with disobeying a peace officer because he violated a lawful out-of-service order. In order to be guilty of this offense, the defendant must willfully disobey the lawful order. 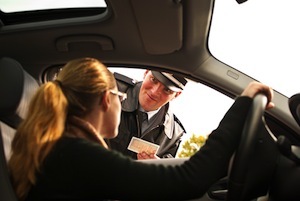 There may be instances where the defendant was not aware that a lawful order has been made. In these cases, the defendant would have a strong defense if charged criminally. In addition, there may be instances where a person must disobey a lawful order due to a life or death emergency. This would occur where an automobile driver ignores a lawfully ordered road closure in order to rush his dying passenger to the hospital. In these cases, the defendant would be able to assert a necessity defense. Disobeying a peace officer is a misdemeanor offense. Those convicted can be sentenced to serve a sentence of up to six months in jail in addition to any specific conditions of probation that are ordered by the court. If you or someone you know have been charged with disobeying a peace officer, it is absolutely critical that you speak with a Los Angeles Criminal Defense Lawyer as soon as possible. As a former Deputy District Attorney with over 14 years of prosecutorial experience, Los Angeles Criminal Defense Lawyer Michael Kraut possesses the knowledge and litigation skills necessary to best defend those charged with offenses like this. Mr. Kraut is highly respected throughout the court system as a top-notch advocate who fights hard on behalf of his clients. For more information about disobeying a peace officer, and to schedule your free consultation, contact Los Angeles Criminal Defense Attorney Michael Kraut at the Kraut Law Group located at 6255 Sunset Boulevard, Suite 1480, Los Angeles, CA 90028. Mr. Kraut can be reached 24/7 at 888-334-6344 or 323-464-6453.